The shawl takes just one skein of the Schaeffer Anne. You could probably do it with a larger skein of sock yarn too. 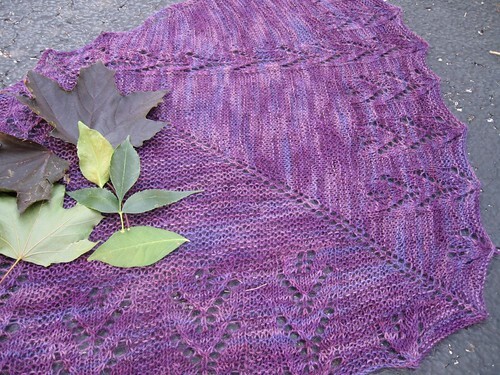 I think it's the perfect shawl to have for the fall. It's nice and cozy with the garter stitch, but has that pretty little leaf pattern running through it. I am so excited how this one came out. Currently, this pattern is exclusive at Fuzzy Wuzzy Yarns as part of a kit. If you want one, you can call the store at 847.253.9276 and Chris can hook you up. The pattern will be available to everyone in February of next year. So that's what I have been knitting lately. How about you? What have you been working on?